A kaleidoscope of colour, a multitude of ages and races, red and blue shirts, black and white, young or old. They came together. A community torn apart by the murder of 11-year-old Rhys Jones was united in grief at his funeral. Blue Everton shirts nestled next to Liverpool's red in a sea of colour. Hundreds of people wore their brightest clothes to celebrate Rhys's short life. Over 2,500 mourners packed into the rows of Liverpool's Anglican Cathedral as the coffin was carried in. 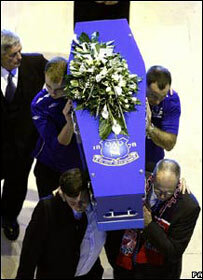 Made in the blue of his beloved Everton and emblazoned with the club badge, the coffin was borne into church by Rhys's father Stephen, older brother Owen and two uncles. When the pews were full, mourners stood at the sides and hovered at the back. Father Andrew Unsworth told the congregation: "Despite the heartbreak and sadness at his death, Rhys's family have become a beacon of light for the community." He said Liverpool had been "shamed by such a crime". In an emotional eulogy to his murdered nephew Neil Jones said: "Talking about Rhys is easy. The circumstances that bring everyone here are hard. Everyone was captivated by his cheeky smile and his bubbly personality. "He was so popular. He was only a small lad, but the size of his personality made up for his lack of inches." The congregation were visibly moved, as one mourner said, they recognised Rhys's qualities in their own children or grandchildren. Those who couldn't make it inside huddled round the media broadcasting vans, listening to coverage of the service. 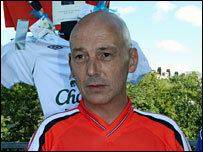 Standing outside was Robert Saven, one of the first to tie a football shirt to the railings. He explained why so many had turned up to pay their respects: "We are all here today united because we know it could have been our kid. It could have been anyone's kid." "We want to show our support and solidarity for the family and the people in Liverpool. "There is still hope. If the government can persuade people in Northern Ireland to put down their guns they can do it for the people of Liverpool." Builders from a local site downed tools to pay their respects. One of them Adrian Howell, 43, said: "We just wanted to come and say goodbye to the little fella, it just felt like the right thing to do." His sentiments echoed those of many who came, shocked at the loss of so young a life. The emotion was heightened in those who knew Rhys. Steve Geoghegan, 48, the manager of Rhys's schoolboy football team said: "People keep asking me how I'm feeling and I don't know. "I keep thinking I shouldn't be here. This shouldn't have happened. All the lads in the team are feeling it tough." Eleven youngsters - Rhys's school friends, football team mates and neighbours - made their way onto the altar to light candles in his memory. The Right Reverend James Jones, Bishop of Liverpool, said "life sparkled out of" Rhys and as he described the youngster's "irrepressible humour" many mourners fought back tears. As the coffin was taken from the church, followed by Rhys's sobbing mother Melanie, the Everton theme tune of Z-Cars was played on the organ and the congregation burst into applause. The sound carried to the crowds outside who joined in and clapped as the funeral cortege drove away for a private family burial service. Still standing by the church, two of Rhys's young school friends were visibly upset by the farewell to their friend. Kelly Henshaw and Laura Turney, both aged 11, said they had asked their mothers to bring them to the service. Laura said: "We wanted to come and say goodbye because we never had the chance."